Since the brilliant *Abby Weintraub* designed my book’s beloved orange and turquoise cover (she is also responsible for Nora Ephron’s I Feel Bad About My Neck and Bill Buford’s Heat among others), I’ve discussed the colors at length with my delightfully indulgent editor, Megan Lynch. There was a story in Elle magazine calling those the colors of spring (they said tangerine and turquoise, same diff). They are also the colors of the Miami Dolphins and Howard Johnson’s! 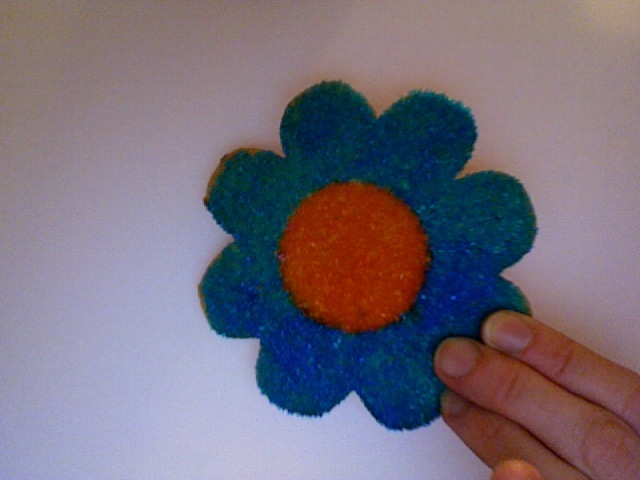 Well, yesterday Paul came across an orange and turquoise cookie, and since I never have anything to say on this blog, let’s all look at it. School is closed this week which means I am watching A LOT of TV. This morning Violet came to me proudly and said, “Mom, remember when I only watched Noggin, now I watch Noggin, Playhouse Disney, Nick Jr., and PBS Kids.” Snif, Snif. It’s true! My little girl is growing up! She watches SO MANY networks. We did the taping of Titlepage yesterday. In addition to the host, Dan Menaker (he was the legendary fiction editor of The New Yorker and then Editor in Chief of Random House and the man who discovered an unknown writer by the name of Matthew Klam in the slush pile), there were four (including me) first time writers (none of the books are out yet but look for them next month). The writers were Ceridwen Dovey, a stunning South African writer who is also charming, eloquent and real smart. Her novel is called Blood Kin (Viking). Keith Gessen, who seemed awfully familiar to me and has written a witty and terrific novel called All the Sad Young Literary Men (Viking), Sloane Crosley, who I’d planned to hate because she’s young and pretty and has written a hilarious collection of coming-of-age essays with the best title I’ve heard in a long time I Was Told There’d Be Cake (Riverhead), (I couldn’t hate her, she was too nice) and me. Being that it was the very first time I was interviewed and it was filmed with five cameras , I think it is safe to say it was a trial by fire. The nice part is that there were only about three things that I said that woke me up in the middle of the night in a cold sweat. I pray they edit me down to a nub. At any rate, go to www.titlepage.tv to sign up to be notified when the show airs (the first one with Richard Price, Charles Bock and Susan Choi airs March 3rd) and the show I’m on called You Never Forget Your First Time is set to air March 17th online. Today I want to turn my attention to Lynne Spears. I was on the grocery line for a long time yesterday trying to figure out which headline she’d enjoy more, “Destroyed by Mama” on Us Magazine with a picture of Britney and Jamie Lynn or “Britney Claims My Mom Slept With My Husband. Is it true- or is she just delusional” on In Touch Weekly with a “crazy” Brit picture. Which would you prefer? I didn’t get a chance to open the Star magazine to find out who looked so unfortunate in a bathing suit but Matt was at LAX so he had time to see for me. It was poor, dear Keely Shaye Smith who seems, these days, to only be famous for being overweight in public (and married to Pierce Brosnan). As I’ve said before, may I never be a celebrity. Even if you get famous as a writer, you’re pretty safe. You never see Joyce Carol Oates’ cellulite on the Enquirer, it’s just not done. I am opening comments today because I want to hear what everyone (all four of you) has to say. This morning I was reading a blog called All Laquered Up. It’s all about … nail polish, that’s it! I was kind of mesmerized by it, the blogger, Michelle, paints her nails in all the latest colors and posts photos of them along with her recommendations. I never do anything with my nails except occassionally bite them when they’re uneven, but now I find myself hankering for the latest shades (I titled today’s post with the name of a of a new navy blue color from the OPI India collection, apparently that’s what all the ladies are lovin’ .) Who knew? No one was more choked up by the New York Giants historic upset of the New England Patriots than the (mostly male) members of my family. If you want to get into the moment watch Eli Manning totally charm David Letterman, take special note of that looooong standing ovation. I’ve been watching it over and over and over again. He is, what we New Yorkers call, a clee-iss act.